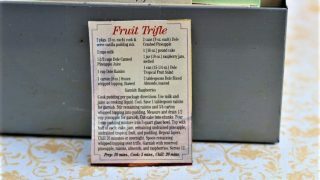 Front of the recipe card for Fruit Trifle. There are lots of fun recipes to read in the box this recipe for Fruit Trifle was with. Use the links below to view other recipes similar to this Fruit Trifle recipe. 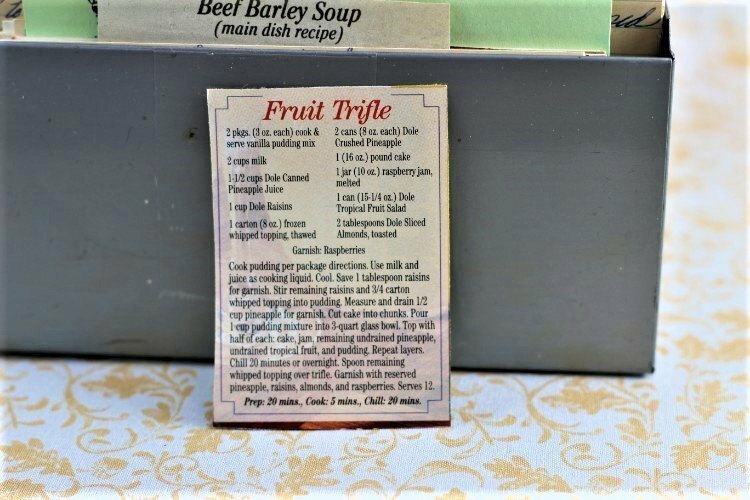 If you make this Fruit Trifle recipe, please share your photos and comments below! 1 (16 oz) pound cake. Cook pudding per package directions. Use milk and juice as cooking liquid. Save 1 tablespoon raisins for garnish. Stir remaining raisins and ¾ carton whipped topping into pudding. Measure and drain ½ cup pineapple for garnish. Pour 1 cup pudding mixture into 3-quart glass bowl. Top with half of each: cake, jam, remaining undrained pineapple, undrained tropical fruit, and pudding. Chill 20 minutes or overnight. Spoon remaining whipped topping over trifle. Garnish with reserved pineapple, raisins, almonds, and raspberries. Prep: 20 mins., Cook: 5 mins., Chill: 20 mins.